Senior g uard Lenzelle Smith Jr. (32) attempts to beat a defender during a game against Dayton March 20 at First Niagara Center. OSU lost, 60-59. For a moment, senior guard Lenzelle Smith Jr. wasn’t sure what the ball’s final fate was going to be. Craft might have been the headliner, but Smith Jr. had been there for every win and every loss of the last four seasons alongside Craft. Smith Jr. said losing to an in-state rival by a single point, 60-59, was a tough way to end his career. Joining the program in 2010, Smith Jr. was part of a landmark class for coach Thad Matta, a group that included Jared Sullinger and Deshaun Thomas — who both have since left to join the professional ranks — as well as J.D. Weatherspoon and Jordan Sibert, who transferred to Toledo and Dayton, respectively. Although Smith Jr. was on the roster, it wasn’t until his sophomore year when he really broke into the Buckeye rotation. In 2011-12, Smith Jr. finished fifth on the team in minutes and points per game, helping OSU make a Final Four run that was eventually ended by Kansas. After a successful junior year, where Smith Jr. was third on the team with 9.2 points per game, the senior, alongside Craft, became the fastest player in OSU history to lead his team to 100 wins. After the loss against Dayton, junior forward Sam Thompson said it was hard to have to bid farewell to the seniors after a close loss. Smith Jr. was the Buckeyes’ second leading scorer this season, averaging 11.0 points per game, but made up a trio of guards that gave OSU its status as one of the toughest defensive teams in the nation. The team finished 12th in the nation by only allowing an average of 59.8 points per game on defense. 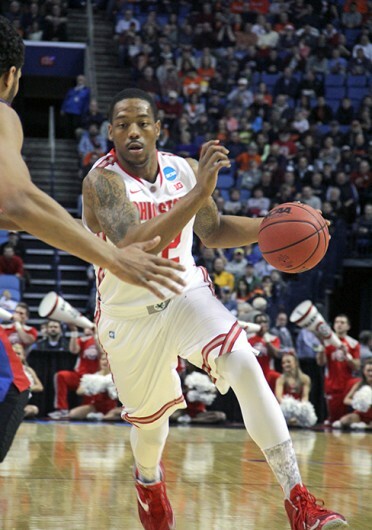 Although Smith Jr. was not one of the two Buckeyes named to the All-Big Ten defensive team (Craft and junior guard Shannon Scott were), he was vital to the team’s defensive identity. But despite the way it ended, Smith Jr. said he wouldn’t trade his time at OSU for anything.